We have been going to the Bistroplex at Southridge. It's a great theatre and everyone there is very friendly. The Tuesday and Friday specials are awesome and the food is great. My husband and I go to the movies every Tuesday and a lot of Fridays as well. This particular movie was on 1/24/2017. We went to see Split. Everything was perfect. The popcorn, the seats, the lighting, and the movie were all great! We love our Showtime Cinema. The staff is always friendly and efficient. The popcorn and pretzel bites are fresh. I have recommended this theater to several people. The Tuesday and Friday deals are fantastic. 4:30pm show of Patriots Day on Jan 18, 2017 (screen #12). It's been quite some time since I've gone to this theater, but not much has visibly changed. It was a slow Wednesday night, so there weren't very many people there. The theater lobby and auditorium was clean, as was the bathroom, so no complaints there. One of the left-side lights in the auditorium was out, but this theater has always had issues keeping those lights maintained. The picture quality was good, as was the sound. Black level was very high, even though the lights were turned down low, which I would attribute to a 3D-friendly screen that washes out the blacks in every Marcus show I've seen in recent memory. During the beginning of the movie, I did notice some heat plumes at the top of the image, but I didn't notice them afterwards. If you're looking for a good place to go to enjoy a movie at a more economical price and it isn't $5 Tuesday at Marcus' other locations, this one is a decent choice without the substandard experience that one might come to expect from a traditional budget theater. Well worth the $5 price of admission. My wife and I went to the show yesterday to see Hot Tub Time Machine for the 12:30 showing. When we purchased our tickets, I paid for the two senior tickets with a $10 bill. The person at the counter said thank you and I asked her for my change, she said there was none as the tickets are $5 each. I love your theater. Everyone is s friendly. The place is immaculate!!!!! That's what's important. Thank you for all the deals you offer us seniors. God Bless you all. Saw The Hobbit on 12/26/2012 in screen #4. Screen #4 was 26' wide. Picture quality was ok, so was the sound. Nothing fantastic, but no issues either. we attended movies here often before it became a Marcus cinema, in the past week we attended two movies. The movies where good but the food was less than satisfactory. The popcorn we ordered was stale, dry and with no butter taste, even though we paid for the real butter, the iced mocha coffee ordered was HOT, when questioned about the coffee the staff responded "we never sell any of them, so we don't know". I liked it when it was showtime cinema. Concession is too expensive.. The only I buy from the concession stand nacho w/cheese. Raisinets and soda I buy at Menards and save $10.. I was really disappointed to see that Marcus Theater has taken over this former gem. No Coke products, No Rosatti's pizza, overpriced concessions and admission, murky 3D. That's Marcus in a nutshell. Showtime was the last first run theater that provided a truly enjoyable experience. I won't be driving out of my way to get to Showtime anymore. I'll be sticking to rentals instead. Once Marcus gets there hands on something it general turns to crap. This was a very nice place to go see a movie during the week when the stinkin kids werent around to scream and yell and just be loud. we wernt limited to one day we could have tuesday through Friday for seniors. nice going marcus , money grubing is your way. Raise the prices lower the quality. Very disappointed since Marcus has taken over management. This was always a place to take my mother for an afternoon movie in a comfortable setting. Now we are limited to the days available for senior pricing. With movie prices and concessions constantly increasing, it seem an afternoon movie for price conscious seniors will soon be a thing of the past!!! Not a customer friendly move on your part Marcus! As one of the previous readers mentioned... I was also disappointed in learning that Marcus bought out the Showtime Cinema! Being a "Senior" myself, I've enjoyed the daily Senior Specials for the matinee shows at $3.75 as well as the popcorn & soda combo at the same price on any four days of the week. When new prices took effect in 2012... the senior special for a matinee show is now only on Wednesdays & Fridays at $4 along with an increased costs for the soda/popcorn combo! I do hope these increased "Young At Heart" prices stay in place for a long time to come & not be phased out as someone mentioned! This is the best kept secret on the southwest side. The staff are always friendly. I'm glad to see ticket prices remain low after the sale. 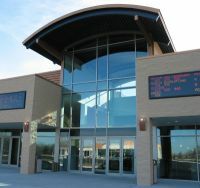 Marcus Theatres purchased Showtime Cinema on December 14, 2011. See Journal Entries page for more details. I love this theatre much more than Marcus and am jealous we don't live nearer. We live close to several other theatres, too, but we will go out of our way to come here. Coming from Tosa, we visit relatives, or make stops at businesses along the way to "justify" the longer trip. This used to be my favorite theater, but in the last 6 months, the sound in the theaters have been painfully loud. I saw the 2:15 showing of "Thor" today and complained about the sound, as I have every time I've gone there recently. And It wasn't just the action sequences, the dialogue was unbearably loud. And for once the movie was actually louder than the trailers. For the first time ever, I had to watch a movie with ear plugs in. I spoke to management afterward and met with an apathetic response. They have no idea what the actual decibel level is of the showing. I've done some research online and loud theaters can really damage your hearing. I've never had to complain at South Shore or the Ridge, so I guess my friends and I will see movies at those places or save our money and stay in and watch DVDs on one of our large flatscreens. I wish they didn't give me another reason to stay home. This theater is awesome. I started going to Showtime when it first opened and go there everytime since. The ONLY complaint is that they are stingy on their food. I love to eat pretzel bites and when i noticed i paid $5.00 for 10 pretzels i was kinda mad. Other than that the theater is clean and the seats are awesome to recline in. LOVE SHOWTIME, prices for admission and snacks so much lower than Marcus. Theaters and washrooms are always clean and the chairs are so large, they rock, and are just great. The only theater my family will go to now. Right off HWY 100 and Loomis. If you want to grab a burger before or after a show, the Ferch's on Hwy 100 and Drexel isn't bad. It's in the shopping center near Target and Pick & Save. They are a little expensive -- $8 for a 1/3 pound burger! -- (look for coupons in the Entertainment book), but it's better than chain burgers and the atmosphere is that of a ice cream shop that serves food as well. This is the only theater my husband and I go to. It is always clean and the staff are always friendly. We have never had a problem with the movie, the sound or people being loud during the movie. The popcorn is also awesome!! I LOVE SHOWTIME!!! This is the only place I take my family...Prices are reasonable, the staff always has a smile on their faces and are ready to answer any of your questions, There's NEVER trash laying around like the Ridge! It's great!! I tell everyone I know! This is the only theater I go to now. This theater is clean and the staff is very friendly. They also have toasted nuts and cookie bites. I have not tried the cookies but he nuts are good. Sometimes the screan is a little off during the credits but the movie is always good. The sound has never been overly loud. Movies always start right on time. Best theater around. Excellent theater! What more is there to say except I have never had a problem with anything there. Great seats, great people, and just a great place all around! I like the lower-priced concessions and the overall experience is on-par with Ridge Cinema. Any chance we can get something that is remarkable, like the Marcus UltraScreens in Brookfield, Mequon, and Racine? A movie like Inception should rattle my seat with the low sounds that are in the soundtrack, but there doesn't seem to be much of that. Maybe the sound just needs to be turned up a little? I have seen 2 movies there so far. They keep it very clean and the staff is very friendly. I am 60 so I get the senior rate and popcorn and soda which is just right for me. I have never gone to a moive by myself before and I feel real comfortable doing it there. I would recomend this place to anyone. Sherlock Holmes on 1/6/2010 in screen #2. The movie started with the bottom half of the screen dark, but when someone went out to tell an usher, the problem was fixed before the end of the beginning credits (probably 3 minutes from the beginning). When we left, an usher was handing out passes for our next visit and apologized for the problem. Very nice customer service! Saw the 7:45 show of Surrogates on 10/15/2009. Picture was good, sound was good except for a quick glitch when the credits started rolling (cue tape placed over the sound data on the film?). Had a small soda and small popcorn (with real butter! ), both were satisfactory. (I usually have the pretzel sticks, but the popcorn smelled good.) The cookie bites looked interesting, so I'll have to try those next time. Theater staff was friendly. As usual, the theater was clean and in good condition with nothing to detract from the movie-going experience.